Riding in new places is one of the best experiences one can have on a bike, so it is unfortunate that travelling with your bike is, at the same time, one of the worst experience one can have with a bike. High transport fees, rough baggage handlers, awkward handling through airports and transit hubs, all make for a less than ideal experience. But I love riding in new places, so I put up with the hassles while constantly searching for a better way. The Airport Ninja from Orucase promises to addresses all those issues in one compact and unobtrusive package. A small outfit started by two American ex-pro riders, who tired of the exorbitant fees charged by airlines, the Airport Ninja flies under the radar by requiring the removal of the front brake and fork, in addition to the usual disassembly required by more conventional designs. 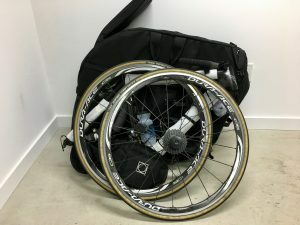 The tight confines of the case mean that the first time packing your bike will require some planning and plenty of time, to figure out how to get everything to fit snugly. My first go took well over an hour, and that was after I had watched Orucase’s instructional video several times and had a good spatial idea of where everything should fit. I supplemented the hard plastic sheet and foam padding of the bag with drop out spreaders and pipe foam insulation. The spreaders are shipped with new bikes and can be sourced from your local bike shop if you ask nicely. I fitted the pipe foam insulation over each frame tube, for a bit of extra peace of mind and scratch protection more than anything else. Once I’ve figured out how everything fit the first time, it was much quicker to pack and unpack my bike from the Airport Ninja, but It does take longer than conventional cases. At the end of my trips, I was able to get my time down to around 30 minutes, but my companions took only 20. Over multiple trips, both domestic and trans-Atlantic, with various airlines, our bikes (up to size 54cm CX frame) always arrived in one piece. Of course, no case is impervious to all impacts and damage, and the Airport Ninja is more dependent on proper packing than conventional designs with more armour. But in our experience, the Airport Ninja provides protection on par with other soft cases on the market. Given its promise and moniker, does the Airport Ninja deliver? I’d have to say yes. That smaller size helped me successfully evade bike fees every single time I’ve used it. Though the gate agent never asked me what was in the bag, neither did it go unnoticed, I got sent to oversize baggage drop off everytime, it wasn’t even a question. Luckily it is easy to stay under the 50 lbs limit with the lightweight Airport Ninja, so I was never penalized. Without doubt, the more compact package of the Airport Ninja made everything about travelling easier. No matter your mode of transport, planes, trains, automobile or on foot, smaller is better. 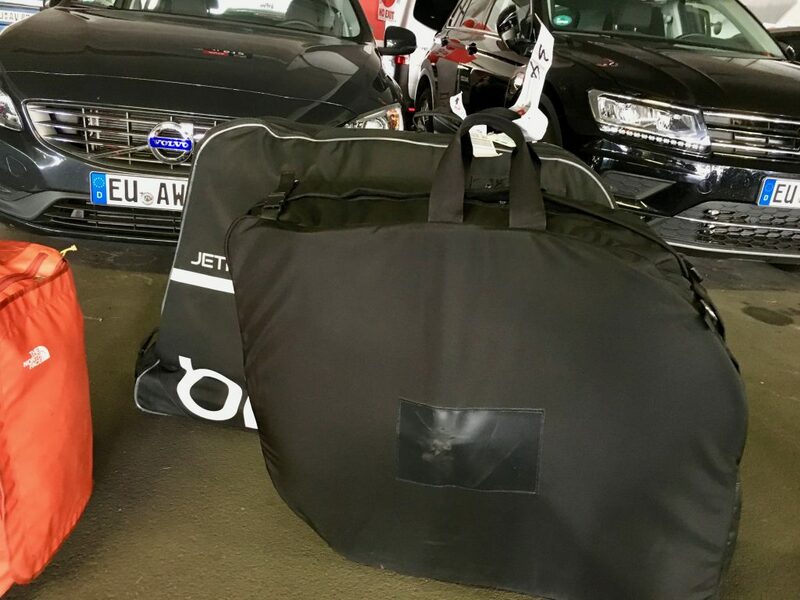 Compared to standard bike cases, the Airport Ninja is quicker to manoeuvre through busy terminals, easier to fit in rental cars or taxi at either end of your destination and in tiny euro hotel rooms. This was particularly apparent on a trip earlier this spring, for logistical reasons I ended up using a more conventional case that is larger and heavier. In manoeuvring it around airports, train stations, and narrow/steep European streets, I really noticed how much bulkier and awkward a regular full size bike bag is compared to the Airport Ninja. That compact form factor does come with some minor trade-offs, aside from more complicated assembly and disassembly, I had to pack more judiciously with the Airport Ninja, as there is less room to throw extra bike related gear compare to a standard case that tends to have plenty of extra room. But I was still able to sneak shoes, nutrition, bottles, and tools into the Airport Ninja, in addition to my bike. This also meant I had to pack my carry-on carefully as well, least I end up checking a second bag, which would cancel out the savings from avoiding bike fees. Be aware if you tend not to be a light traveller. It may also be tricky to use the Airport Ninja if your bike is highly integrated, whether that is in the form of seatposts, brakes, internal cable routing, etc. Not impossible, but you will definitely want to give it some thought before committing to the AIrport Ninja. Over many months of travels, with multiple flights, the Orucase Airport Ninja has shown itself to be durable and reliable transport for my bike, it has become my go-to bag anytime I travel with my bike. Given the ever rising cost of airline bike fees, it will probably be the case for the foreseeable future. No bike bag or case are perfect for everyone in every situation, but the Orucase Airport Ninja is a compact and well considered case that will protect your bike and save you money, provided you have some mechanical aptitude.